The difference between AWS and traditional IT models is flexibility. The traditional models used to deliver IT solutions that require large investments in a new architecture, programming languages, and operating system. Although these investments are valuable, it takes time to adopt new technologies and can also slow down your business. The flexibility of AWS allows us to choose which programming models, languages, and operating systems are better suited for their project, so we do not have to learn new skills to adopt new technologies. Flexibility means that migrating legacy applications to the cloud is easy, and cost-effective. Instead of re-writing the applications to adopt new technologies, you just need to move the applications to the cloud and tap into advanced computing capabilities. Building applications in aws are like building applications using existing hardware resources. The larger organizations run in a hybrid mode, i.e., some pieces of the application run in their data center, and other portions of the application run in the cloud. The flexibility of aws is a great asset for organizations to deliver the product with updated technology in time, and overall enhancing the productivity. Cost is one of the most important factors that need to be considered in delivering IT solutions. For example, developing and deploying an application can incur a low cost, but after successful deployment, there is a need for hardware and bandwidth. Owing our own infrastructure can incur considerable costs, such as power, cooling, real estate, and staff. The cloud provides on-demand IT infrastructure that lets you consume the resources what you actually need. In aws, you are not limited to a set amount of resources such as storage, bandwidth or computing resources as it is very difficult to predict the requirements of every resource. Therefore, we can say that the cloud provides flexibility by maintaining the right balance of resources. AWS provides no upfront investment, long-term commitment, or minimum spend. You can scale up or scale down as the demand for resources increases or decreases respectively. An aws allows you to access the resources more instantly. It has the ability to respond the changes more quickly, and no matter whether the changes are large or small, means that we can take new opportunities to meet the business challenges that could increase the revenue, and reduce the cost. In a traditional IT organization, scalability and elasticity were calculated with investment and infrastructure while in a cloud, scalability and elasticity provide savings and improved ROI (Return On Investment). Scalability in aws has the ability to scale the computing resources up or down when demand increases or decreases respectively. Elasticity in aws is defined as the distribution of incoming application traffic across multiple targets such as Amazon EC2 instances, containers, IP addresses, and Lambda functions. Elasticity load balancing and scalability automatically scale your AWS computing resources to meet unexpected demand and scale down automatically when demand decreases. The aws cloud is also useful for implementing short-term jobs, mission-critical jobs, and the jobs repeated at the regular intervals. AWS provides a scalable cloud-computing platform that provides customers with end-to-end security and end-to-end privacy. AWS incorporates the security into its services, and documents to describe how to use the security features. AWS maintains confidentiality, integrity, and availability of your data which is the utmost importance of the aws. Physical security: Amazon has many years of experience in designing, constructing, and operating large-scale data centers. An aws infrastructure is incorporated in AWS controlled data centers throughout the world. The data centers are physically secured to prevent unauthorized access. Secure services: Each service provided by the AWS cloud is secure. Data privacy: A personal and business data can be encrypted to maintain data privacy. 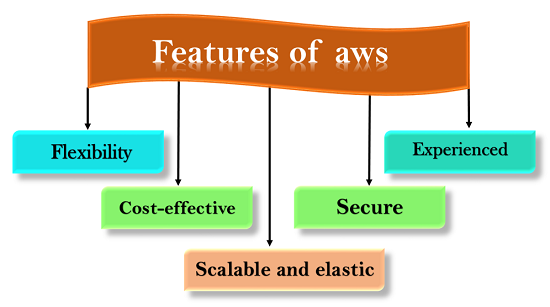 The AWS cloud provides levels of scale, security, reliability, and privacy. AWS has built an infrastructure based on lessons learned from over sixteen years of experience managing the multi-billion dollar Amazon.com business. Amazon continues to benefit its customers by enhancing their infrastructure capabilities. Nowadays, Amazon has become a global web platform that serves millions of customers, and AWS has been evolved since 2006, serving hundreds of thousands of customers worldwide.